I WAS provided with a link to this website, maintained by a legal clerk in Washington DC, which he has now decided to take it down after his superiors suggested it was unpatriotic. [See his comments on this]. It shares many of our own suspicions, as regular AR-readers will know. We are preserving the page here, and have left in his outlinks, but added our standard icons for these; and we have added the map and picture of the crater. I'M NOT a paranoid, conspiracy theory buff. 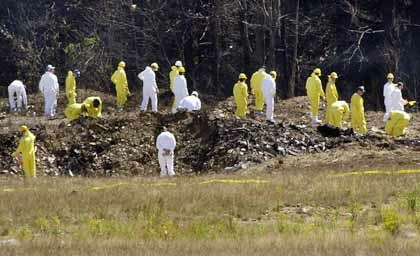 But I can't help wondering what really happened to Flight 93, the hijacked plane that crashed in Pennsylvania. We've all read the many stories about the guys on board Flight 93 who heroically decided to fight back -- Todd Beamer, Mark Bingham, Thomas Burnett, Jeremy Glick. I do not question their heroism. Their names should be remembered and taught to schoolchildren, like Nathan Hale or Paul Revere. But there is one fact that makes me wonder whether the real reason Flight 93 crashed was because of the heroic struggle of the passengers onboard. The fact is this: the 911 call that one passenger made from a bathroom. On September 11, and for a couple of days afterwards, there were several newspaper stories that mentioned a statement made by Glenn Cramer, a local emergency dispatcher. He said that a passenger on Flight 93 had called 911, with the frantic message that the plane had been hijacked. In Cramer's words , "He heard some sort of explosion and saw white smoke coming from the plane, and we lost contact with him." This, of course, was before the plane crashed. FBI agents quickly took possession of the tape of that 911 call, which constitutes the only public evidence so far of what went on during the doomed plane's last moments. The FBI declined to provide any information about the tape's contents or the identity of the caller. Nor did the FBI allow the dispatcher who took the call to talk any further to the media. A story on September 11 said this: "[Westmoreland County spokesman] Stephens said the passenger gave the dispatcher information about the situation on the plane, but said the FBI has ordered details not to be released." (Mike Wagner & Ken McCall, "Pennsylvania Crash Might Yield Important Evidence," Cox News Service). Isn't that odd? I know that the stories of the other phone calls from Flight 93 were much more heroic and inspiring. But isn't it strange that we have heard simply nothing whatsoever about what could have caused the explosion that the 911 caller heard? Nothing? Laura Temyer of Hooversville RD1 was hanging her clothes outside to dry before she went to work Tuesday morning when she heard what she thought was an airplane. "Normally I wouldn't look up, but I just heard on the news that all the planes were grounded and thought this was probably the last one I would see for a while, so I looked up," she said. "I didn't see the plane but I heard the plane's engine. Then I heard a loud thump that echoed off the hills and then I heard the plane's engine. I heard two more loud thumps and didn't hear the plane's engine anymore after that." Some suggest that the hijackers set off a bomb. After all, some of the other passengers who made phone calls said that the hijackers claimed to have a bomb with them. I want to reiterate that I'm not a conspiracy theorist. I should also make it clear that I wouldn't mind at all if, as some people have speculated, Flight 93 crashed because the military shot the plane down. I see no ethical principle that would forbid such an action. I'm just interested in finding out what really happened, and a healthy dose of skepticism about the official story seems warranted here. With all that has come out about the hijackings, no one has even attempted to explain the explosion that apparently took place aboard Flight 93. The author of the above is a clerk for a judge of the D.C. Circuit Court of Appeals, and a recent graduate of Harvard Law School.